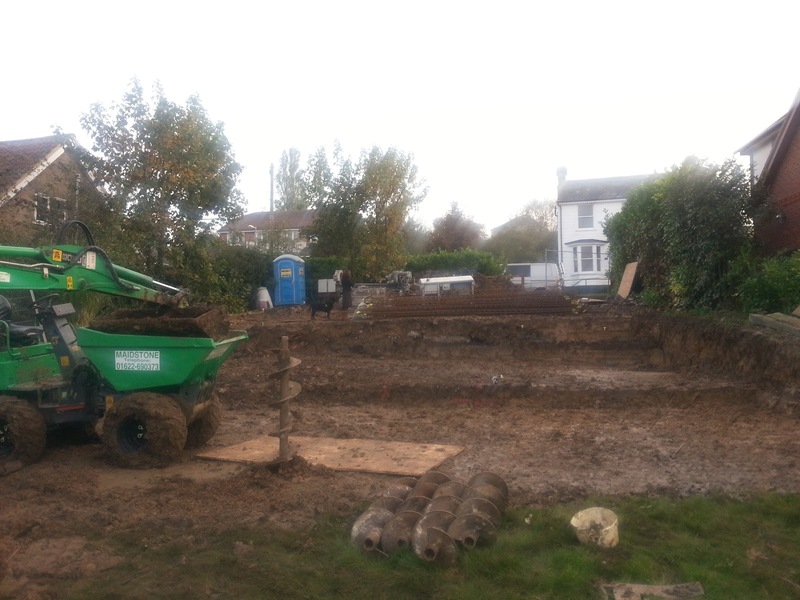 We have to have piled foundations due to both the soil type on the plot which is a dense London clay and the sloping nature of the site. This doesn't come cheap so unfortunately a lot of our costs are going deep into the ground never to be seen again. We are having 22 piles which support the ring beam on which the house will be built. Our piles have to be friction piles as opposed to bearing piles. Bearing piles are driven down through soft soil until they reach a firm base on which to support the load but friction piles rely on creating friction between the pile and the surrounding soil so the load is transferred downward and laterally into the soil. You can see a very big drill bit stuck in the earth here! The 30mm wide holes are drilled deep into the ground, then a ReBar is sunk into the tunnel like hole which is filled with concrete thus creating an incredibly strong concrete and steel column....... ta da, there's a little lesson and that's as much as I know (and probably will ever need to know) about piling. It wasn't completely known how deep the piles would have to be until the rig started drilling - in the end the deepest piles are 17 metres deep and shortest 11 metres - our house isn't going anywhere, I'm guessing if we had a landslide we'd still be sitting pretty in our house on stilts!! Good Bye to the Piling Rig.... Phew!! !